We’d love your help. Let us know what’s wrong with this preview of Some Grand Dust by William Minor. William Minor had been married (to the same woman!) for thirty-eight years when he started his collection of short pieces entitled Our Peasant Life. Minor spares neither wit nor compassion when he explores marriage, love, household, family, and neighbors in this charming work. In Moker, Minor turns his life around, imagining that he hadn't pursued the woman he would love t William Minor had been married (to the same woman!) for thirty-eight years when he started his collection of short pieces entitled Our Peasant Life. Minor spares neither wit nor compassion when he explores marriage, love, household, family, and neighbors in this charming work. In Moker, Minor turns his life around, imagining that he hadn't pursued the woman he would love the rest of his life, or the passion for music that has kept him focussed. His alter ego, Moker, pads about an empty apartment in bare feet, divorced (he didn't find the right woman! ), imagines a daughter he never had, and finds peace through acceptance and humor. Minor's skillfully crafted poems weave a story of life, longing, and loving in the years beyond youth. 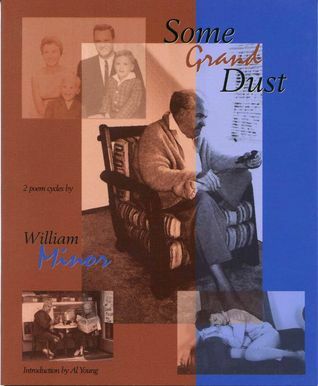 Some Grand Dust is an extraordinary portrait of ordinary lives. To ask other readers questions about Some Grand Dust, please sign up. William Minor was originally trained as a visual artist (Pratt Institute and U.C.-Berkeley), and exhibited woodcut prints and paintings at the San Francisco Museum of Art, the Pennsylvania Academy of the Fine Arts, the Smithsonian Institution, and other museums and galleries. His woodcut prints incorporated the text of Russian, Modern Greek, and Japanese poetry--which he also translated. He began William Minor was originally trained as a visual artist (Pratt Institute and U.C.-Berkeley), and exhibited woodcut prints and paintings at the San Francisco Museum of Art, the Pennsylvania Academy of the Fine Arts, the Smithsonian Institution, and other museums and galleries. His woodcut prints incorporated the text of Russian, Modern Greek, and Japanese poetry--which he also translated. He began to write poetry as a graduate student in Language Arts at San Francisco State, producing his first book, Pacific Grove, in 1974. Bill has, since that time, published five more books of poetry: For Women Missing or Dead, Goat Pan, Natural Counterpoint (with Paul Oehler), Poet Santa Cruz: Number 4, and Some Grand Dust (Chatoyant Press), for which he was a finalist for the Benjamin Franklin Award. His short fiction has been selected for inclusion in Best Little Magazine Fiction (NYU Press) and The Colorado Quarterly Centennial Edition. A jazz writer with over 150 articles to his credit, Bill has also published three books on music: Unzipped Souls: A Jazz Journey Through the Soviet Union (Temple University Press), Monterey Jazz Festival: Forty Legendary Years (Angel City Press; Bill served as scriptwriter for the Warner Bros. film documentary based on the latter, same title as book), and Jazz Journeys to Japan: The Heart Within (University of Michigan Press. A professional musician since the age of sixteen, Bill set poems from For Women Missing or Dead to music and recorded a CD--Bill Minor & Friends (on which he plays piano and sings). A second CD, Mortality Suite, offers original poems and music. Bill was also commissioned by the Historic Sandusky Foundation to write a suite of original music and voice script based on a married couple’s exchange of letters throughout the Civil War: Love Letters of Lynchburg. More biographical information and links are available at www.bminor.org.